There are many different systems so this post will touch on some important areas. Consult your owner’s manual or check the maker’s website for detailed maintenance items and recommendations. Most "Box Style” systems require a dedicated power supply, terminating in a receptacle that will accept a standard "Cigarette Lighter” plug. On older vehicles with true cigarette lighters, the existing wiring was capable of carrying up to 15 amps of power to heat the lighting element. Today these power outlets are designed to recharge cell phones or power low power items such as GPS’s. All of the makers of these brake systems have auxiliary power outlet kits which will provide sufficient power safely. Read one of our following Blog postings to see how to make your own. If the brake system requires adjustment or can be adjusted, ensure that it can be done either each time you set up if that is required to tow or if it is permanently installed, ensure that it is still within the adjustment range. Adjust as required to be within the brake system’s manufacturer’s specification. Check to make sure that the warning system that lets you know that the brake is "On” in the towed vehicle is working. It is not only necessary to monitor normal brake action of the towed vehicle, it is especially necessary should the breakaway system be triggered. 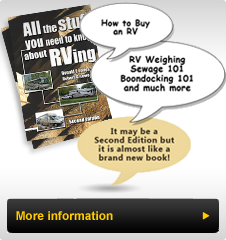 On many systems the breakaway pin is no longer removed and reinserted each time the system is connected and disconnected from the tow car and RV. Instead a removal carabineer with coiled cable is connected and disconnected. This lack of "exercise” can cause the switch to corrode and not function when the pin is removed. Pull the pin out and confirm that the brake system actuates the towed vehicle’s brake pedal as it should. If not, clean the internal connections with a material such as Corrosion Block® or replace the defective switch. I recommend checking it each time you setup the system. If your brake system requires air to operate then ensure that the coach air is up and the connection to the Towed Vehicle is connected at both coach and Towed Vehicle ends.